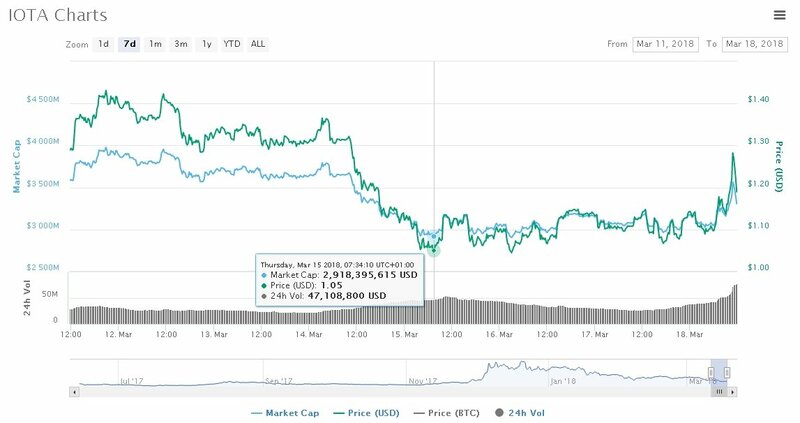 IOTA token value against the US Dollar is leading the crypto-market today by performance as in the last 24-hours it is the only gaining an upper hand against the bears with 4.20% gain. Accordingly against the BTC market it is 13.24% ahead while reaching the $1.20 mark for the first time in 4 days. The case is just another example of how unpredictable the market has become as sometimes using to-happen-events, news or various developments with a coin for forecasting the price moving patterns is close to impossible. Today [March 18], the pair [M]IOTA/USD jumped for a couple of minutes to the heights of $1.30 but reversed speedy again. If the pair manages to climb over the important $1.20 and balance bears/bulls it might continue increasing. However, the market in general is still constantly decreasing so that could drag IOTA downward.